Reprint. Originally published: Chichester: Ellis Horwood, 1985. 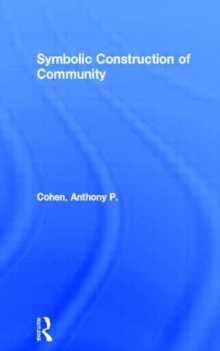 Anthony Cohen makes a distinct break with earlier approaches to the study of community, which treated the subject in largely structural terms. His view is interpretive and experiential, seeing the community as a cultural field with a complex of symbols whose meanings vary among its members. He delineates a concept applicable to local and ethnic communities through which people see themselves as belonging to society. The emphasis on boundary is sensitive to the circumstances in which people become aware of the implications of belonging to a community, and describes how they symbolise and utilise these boundaries to give substance to their values and identities.